Chronos & Kairos is suspended over an active gate waiting area at the San José International Airport. Chronos & Kairos is a suspended robotic sculpture that juxtaposes Chronos, time as a measured quantity, with Kairos, momentary, suspended time. 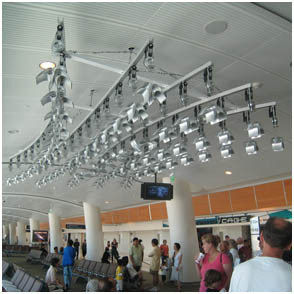 Sixty-five kinetic "nodes" are suspended in a curved grid below the gate area ceiling. The hanging nodes are each composed of two graceful metal arcs that rotate around each other in midair, manipulated with a visible pulley system. Linked with a "Jacob's Ladder" fabric hinge, the arcs maintain a mysterious physical connection as they rotate. This mesmerizing motion is multiplied by choreographed patterns moving across the nodes. When they are doing nothing else, each node is softly kinetically active; slowly breathing up and down through a subtle mechanical motion. Each node can change or "flip" between states. The curve of the crescents can face upward, making a "W", or downward, making an "M". Halfway in between, the crescents make an "X". The counting movement travels in a steady rhythm across the sculpture, gradually "filling" it up like an abacus. When the counting has "filled" the sculpture, the "Close" event happens: a node rotates all the way closed, creating an oval shape. It has seized its moment of Kairos, stepping outside the ordered march of time to a state of tranquility. Node by node, the closing slowly transforms the structured ticking of Chronos to the beauty and opportunity of Kairos.